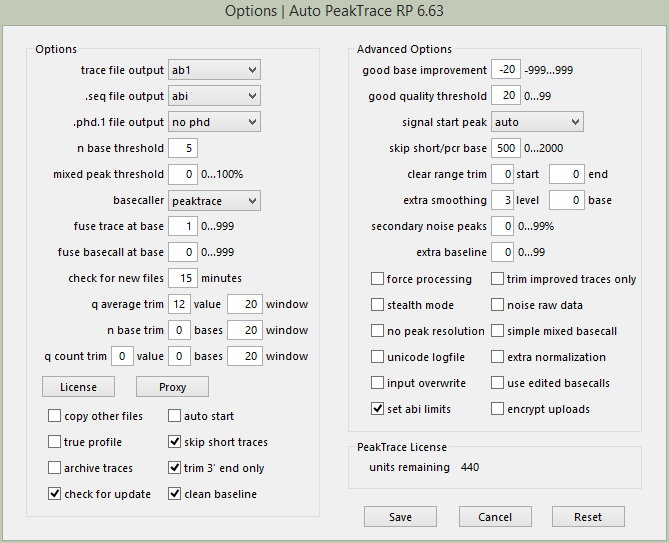 We have released a small update for Auto PeakTrace and PeakTrace (6.61). This corrects an error in the handling of .seq files when skip short traces and set abi limits is used when no trace trim function is used. This bug has been corrected on the server side for Auto PeakTrace RP. 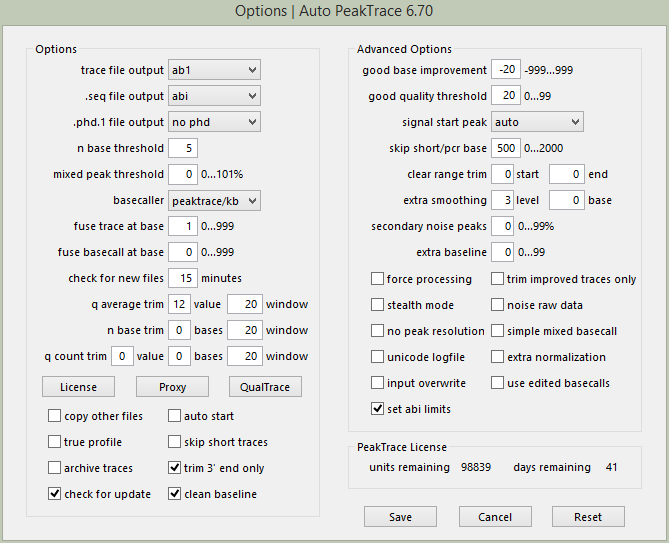 We have released Auto PeakTrace 6.60 and PeakTrace 6.60 for Windows & Linux. This is a major upgrade that involved the improvement of many aspects of the PeakTrace Basecaller to improve the trace output and basecalling. The most significant change in 6.60 is the introduction of a new basecaller output – RelTrace. This outputs the raw peak data mobility shifted, baselined, and the ccd detector noise removed along with either the KB Basecaller or PeakTrace basecalls. This setting is ideal for applications requiring measurement of the true relative peak heights such as polymorphism or methylation studies where the normal processing provided by PeakTrace or KB basecallers will distort the true relative peak heights. New Feature. RelTrace basecaller output. New Feature. Use of set abi limit without trimming outputs trace file without removing the non-basecalled regions. New Feature. The .seq files are output with trace trimming when set abi limits on. New Default. The set abi limits is now on. New Error Code. 23. KB fallback failed. Improved trace processing that avoids suppression of large secondary peaks. Improved processing of true profile traces. Improved detection and processing of PCR product and weak signal traces. ABI/KB basecalled traces no longer have adjustments to the quality scores. Update of the CodeMeter runtime to 6.50a. New Feature. QualTrace III only Trace Reports. Improvements to mixed basecalling to reduce the false negative rate. Improvements to the processing of short traces to increase trace read length. Improvements to the fuse trace module. The .scf file now records the correct basecaller if stealth mode or abi/kb basecaller options are used. Update of CodeMeter runtime to 6.40a. PeakTrace 6.50 for Linux, PeakTrace 6.50 for Windows, and Auto PeakTrace 6.50 can be downloaded as usual from the PeakTrace:Box Downloads page. The automatic update for Auto PeakTrace will be released in the coming days. If you are currently running a version of PeakTrace from before 6.10 you will also need a license upgrade and/or the PeakTrace Serial Number. Please contact us to obtain these updates. The changes and improvements of this release have also been provided to the RP servers so users of Auto PeakTrace RP will obtain them automatically. Auto PeakTrace 6.47, PeakTrace 6.47 for Windows, and PeakTrace 6.47 for Linux x86_64 have been released. This update is a bug fix and optimisation release that resolves a number of outstanding bug and small annoyances. It is a recommended update for all users of PeakTrace 6.40 or greater. Improvements to Auto PeakTrace prevent the reading of the empty dot file created when copying files from Mac OS to Windows drive. Improvements to no peak resolution option. Improvements to the mixed basecalling module. QualTrace III analysis is not turned off by corrupt .ab1 files. Force processing will now PeakTrace basecall traces where the fuse trace or fuse basecall fails. Fixed a bug which prevented TraceTuner basecalling working on Windows 8.1 and higher. Fixed a bug which caused input overwrite to not work with Auto PeakTrace. Fixed a bug which caused an inaccurate basecall improvement when using set abi limits. Fixed a bug that prevents short traces being reprocessed through KB after PeakTrace basecalling. Fixed a bug with the trace processor reported in .phd.1 files. Update of the required CodeMeter runtime to 6.40. Auto PeakTrace 6.47, PeakTrace 6.47 for Windows, and PeakTrace for 6.47 for Linux x86_64 can be downloaded from the PeakTrace:Box Downloads page. If you are currently running a version of PeakTrace from before 6.10 you may also need a license upgrade and/or the PeakTrace Serial Number. 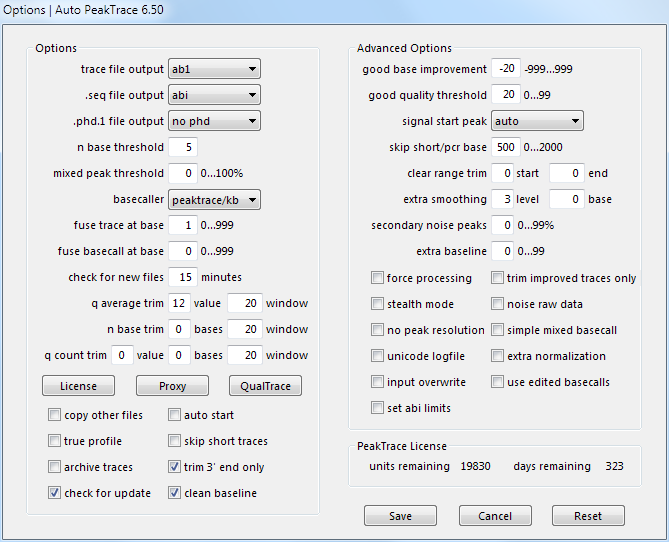 Auto PeakTrace 6.46, PeakTrace 6.46 for Windows, and PeakTrace 6.46 for Linux x86_64 have been released. This update is a bug fix and optimisation release that improves the mixed basecalling and clean baseline modules and is a recommend for all users of PeakTrace 6.40 or greater. Bug fixes and enhancements for the clean baseline module to avoid the removal of true mixed peaks. Improved processing of short failed traces and mixed traces. Improvements to the mixed peak threshold module to improve mixed basecalling. Update of the CodeMeter runtime requirement to 6.30d. A new error code (59: Mixed trace). Auto PeakTrace 6.46, PeakTrace 6.46 for Windows, and PeakTrace for 6.46 Linux x86_64 can be downloaded from the PeakTrace:Box Downloads page. If you are current running a version of PeakTrace from before 6.10 you may also need a license upgrade and the PeakTrace Serial Number. Bug fixes and enhancements of the extra baseline module. Bug fixes and enhancements of the clean baseline module. Enhancement of the mixed basecalling module (mixed peak threshold) to improve performance. Enhancements of the peaktrace/kb basecaller option to enable more traces to be improved. Improvements to the processing of PCR product traces. Bug fix for QualTrace III only processing of traces that can cause a crash. If you are current running a version of PeakTrace from before 6.00 you may also need a license upgrade. Additional checks for PeakTrace USB Key issues. Update of the CodeMeter runtime to 6.30. Bug fixes for the auto start and clean baseline modules. Improvements to fuse basecall module.